Teachers now require high levels of statistical literacy in order to take advantage of the many statistical reports analysing assessment data that are provided by system authorities. 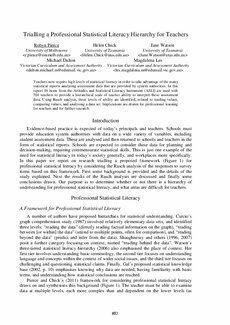 In this report 16 items from the Attitudes and Statistical Literacy Instrument (ASLI) are used with 704 teachers to provide a hierarchical scale of teacher ability to interpret these assessment data. Using Rasch analysis, three levels of ability are identified, related to reading values, comparing values, and analysing a data set. Implications are drawn for professional learning for teachers and for further research.